SWAMPVILLE, Florida — Ever since Lucy Tight and Wayne Waxing joined their romantic and musical fortunes together, hooked their home to a trailer hitch and drove off to look for as many of America’s music-loving pockets as they could find, the duo known as Hymn for Her has been living many adventures, one stop at a time. Their red-hot blend of roots music — and ferocious live shows — have also carried them to locales around the globe, attracting fans everywhere they go. With Pop-N-Downers (out on October 5, 2018), they’re ready to reach even more. Mingling textures and tones far removed from the “hayride to hellsy” twang-rock blast of their 2016 release , Drive Til U Die, the songs on Pop-N-Downers simultaneously exude sophistication and a charming, childlike whimsy. A colorful Tropicália vibefloats through several of these tunes, imbuing them with a lightness of being even when the lyrics turn heavy. The album unfolds with the lush, full sound of “Blue Balloons,” which evokes Sgt. Pepper’s in its sweet harmonies, theatrical presence and pointed lyrics. “’Blue Balloons’ gets its life from the joy and sorrow we experience on our travels,” Lucy says. “We hope future generations can find the beauty in a world spinning out of control." “Dingle Town,” influenced by Hymn for Her’s recent tour of Ireland, slams together the drone of bluegrass and Celtic modalities with blues harmonica, crunchy guitar, handclaps, foot stomps, “bang-o” (a drummed-upon banjo) and whatever else they could wedge into its sonic soundscapes. Lucy plays banjo/bang-o and cigar-box guitar simultaneously on this one. The path to Pop-N-Downers starts in Swampville, Florida, where Lucy and Wayne park their Bambi Airstream/mobile recording studio whenever they need to plot their next course. That’s where the co-producing couple recorded song demos before heading to Nashville to reunite with Grammy-winning producer Vance Powell (Chris Stapleton, Sturgill Simpson, Jack White), who helmed much of Drive Til U Die, at his Sputnik Sound Studio. The album’s character might be best summarized with a description of its sixth track, “Fireflies,” a lovely, sunny-sounding mid-tempo ballad — with a bite. A similarly airy feel permeates “Shallow Graves,” contrasting directly with the disturbing events to which it alludes. Then there’s “Scoop,” a lighthearted little groover written in the Sputnik Studio lounge at the last minute. The sessions had just ended, so they recorded it back home at Bambi Studios . Their daughter Diver and her friends chime in on the catchy choruses. Diver also plays the mournful violin heard on the gentle, sadly moving “Yard Sale.” And she directly inspired “First Clown on the Moon,” a lively, banjo-driven song about love and joy that mashes Barnum & Bailey together with dream pop. “Her very first career choice was to be the first ballerina on the moon,” Lucy explains. “A day later, she changed it to first clown on the moon.” (Her grandfather’s fanciful illustration of Diver’s lunar landing appears on the album’s inner sleeve.) When she was much younger, she covered “It’s Only a Paper Moon,” an unlisted 12th track on Drive Til U Die, recorded in the direct-to-acetate booth at Jack White’s Third Man Records in Nashville. But even when they address the “downer” aspects of our human condition, Hymn for Her leaven those messages with buoyant balloons, reminding us we can still dance with the fireflies and smell the roses ... thorns and all. Sat., Nov. 17 ELLSWORTH, ME Fogtown Brewing Co. 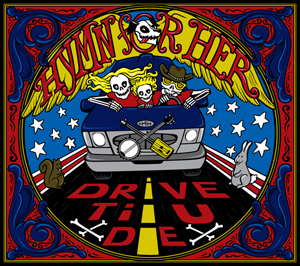 ANYWHERE, U.S.A. — For Lucy Tight and Wayne Waxing of Hymn for Her, Drive Til U Die is more than an album title. It’s a manifesto. A mantra. But to call this Americana duo and their daughter road warriors would be a misnomer; to them, the road isn’t a battleground to conquer, it’s their beloved home. A nomadic tribe of three (formerly four; their late lab, Pokey, now serves as their guardian angel), they dwell in a ’61-vintage Bambi Airstream towed by a Ford van whose odometer shows nearly half a million miles — which, they proudly note, equals a trip to the moon. And back. Sleeping to the rhythm of spinning wheels, they thrive on spontaneity, friends and the moments that make it worthwhile: when they stand onstage and unleash their dynamic yin-yang of high-octane outlaw rockers and honey-sweet, harmony-laden ballads. The groovin’ twanger “Hi Ho Silver,” another ode to the road, began as notes about hitching and unhitching the Airstream, a rather complex process, says Wayne. “When we were done,” Lucy says, “it read as lyrics.” So it became a song — one with a galloping finish that’ll make “Lone Ranger” fans wave their hats. But let’s start this journey where they did: in Philadelphia, where Lucy worked in a music store and Wayne worked in a hoagie shop (sub shop, for you non-natives). She’d buy hoagies; he’d buy strings. They started playing open mics together. Then they hit the road. They recorded its follow-up, Hymn for Her Presents … Lucy and Wayne’s Smokin Flames, at Detroit’s Ghetto Recorders with producer Jim Diamond (the White Stripes, the Fleshtones). That gave them room to kick out even more jams, with Wayne on acoustic guitar, harmonica, kick-drum, hi-hat, and “bang-o” — banjo as drum — and Lucy on banjo, guitar and the broomstick-necked electric cigar-box. Recording for Drive Til U Die started at Sputnik Sound Studio in Nashville, with five foot-stomping tracks produced by Vance Powell (Chris Stapleton, Sturgill Simpson, Jack White). On most of those, Wayne says, “I ran the acoustic guitar through a small, distorted tube amp, a technique inspired by early Keith Richards.” The trick gave “Shine” its swampy, gumbo spice. But the crunchy psychedelic riffs underlying the upbeat melody and lyrics on “Paraguay” come straight from the Lowebow — and Lucy’s skill at making it wail. The slow-groovin’ “Seas of Croatia,” inspired by a sailing trip, is one of several songs that highlight Lucy’s dreamy voice, along with their tightly woven harmonies and intricate instrumentation. Like Hymn for Her do every time they hitch up the Airstream and jump in the Ford. They recorded their last album, Hymn for Her Presents . . . Lucy and Wayne and the Amairican Stream, in their vintage 1961 Bambi Airstream trailer at locations stretching from Philadelphia to Malibu on a three-month tour. 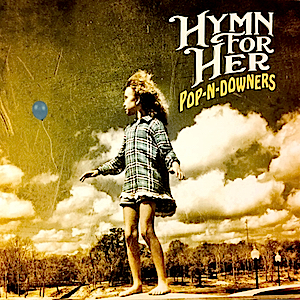 For their new release, Hymn for Her Presents . 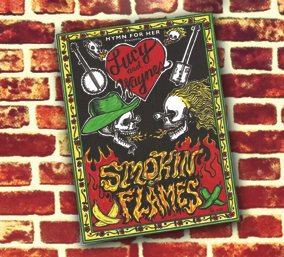 . . Lucy and Wayne’s Smokin Flames, due out April 23rd, the twosome wanted to kick it into high gear. They traveled to Detroit to work with Jim Diamond, who mixed The Amairican Stream. In his Ghetto Recorders studio, the former White Stripes producer helped evolve their “stompgrass” sound to something even more heavy and rockin’. Arriving at Diamond’s studio with road-tested tunes, Hymn for Her recorded live and mixed 12 original songs in just one week. “People wanted what they heard live at shows and we captured that moment and corked it,” explained Lucy. 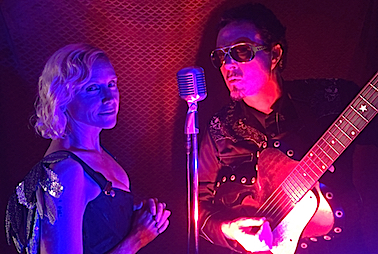 “Mojave” stands among several Smokin Flames songs that were inspired by Lucy and Wayne’s desert night highway hallucinations. “Rosa Parks Blvd.,” a revved-up punk-abilly number, comes from their squatter days in Detroit. “Landescape,” an ode to nomads, suggests finding a place to cherish and hold in one’s heart during life’s hard travels. After reading a plaque at Big Sur’s Pfeiffer Beach about a young girl, her mother and grandmother who all drowned together, Lucy was inspired to write the deeply felt “Ivy Pacheko.” She revealed that H4H weren’t planning on including this tune on Smokin Flames; however, just before the recording sessions began, she got an email reply from Ivy’s brother (nearly a year after emailing him). He thanked her for writing the song. Lucy saw this as a sign the song needed to be on the album. “Ivy,” along with tracks like “For the Dead” and “Dark Deeds,” takes listeners down a rather macabre path. The demonic-sounding “Lucy Fur” continues down this blood-stained dirt road with its story about “the daughter of Lucifer,” but actually reveals the duo’s devilish sense of humor. The tune, according to Wayne, is about their beloved six-year-old spawn, “99% angel, 1% baby of Beelzebub”. Although Hymn for Her hails from Philadelphia, Lucy characterizes H4H as “a band born on Route 66.” With their daughter Diver, Manny the nanny and Pokey, their spirit guardian dog, this little self-contained unit enjoys life’s unknown adventures on the highway. They recently had a successful U.K/European tour and plan to return soon. Always pondering new, space-age ideas for the future, the duo’s motto in life is “Inspire ’til you expire.” They’d love to transform their Airstream rocket into a mobile studio, a touring radio station, a mini-cinema and popcorn stand (with banana hot sauce) or even a botanical garden. Music, however, remains their lifeblood, as the two burn up the highway and ignite your town this year to promote Hymn for Her Presents . . .Lucy & Wayne’s Smokin Flames. Come out and taste the heat, y’all!